Ryosuke graduated with his B.S. in Global Engineering/Mechanical Engineering from Kogakuin University in 2014 and his M.S. 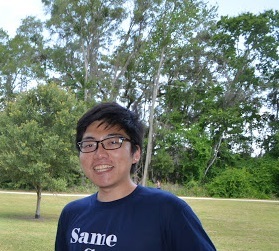 in Mechanical Engineering from the Florida Institute of Technology in 2016. He is currently a PhD student in Mechanical Engineering under the advisement of Dr. Simmons. He has been collaborating on mechanobiology research with Dr. Glover’s lab in Gastrointestinal Medicine. His projects include image analysis for traction force microscopy (TFM), fabrication of polydimethylsiloxane (PDMS) silicone for tissue stiffness-matched substrate, and biological analysis for cells on stiffness-matched surface such as qPCR, immuno staining and imaging. His research interests are cellular biology, biomedical materials, and image analysis. Abstract: Intestinal epithelial Caco-2 cells are often used in pharmaceutical research to test absorption of various compounds, but rigid plastic transwell surfaces do not match the mechanical properties of intestine. 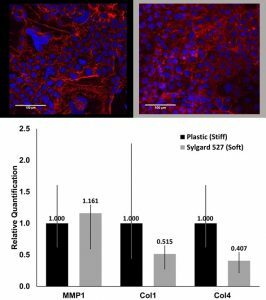 We have used a custom characterization tool to quantify the mechanical properties of human, porcine, bovine, and murine intestine, and we have fabricated soft cell culture surfaces from polydimethylsiloxane (PDMS) to mimic properties of the intestines. Properties of large and small intestines of all patients and animals quantified were 1-10 kPa, and Sylgard 527 was used to match these values (~5 kPa). Sylgard 182 was also used to make an intermediate substrate (~2MPa) softer than plastic (GPa) that is commonly used in other mechanobiology experiments, allowing us to compare results in the literature. We observed that intestine-like stiffness slows cell adhesion compared to the plastic (GPa) control surface, and metabolic (MTT) assay quantified lower activity on PDMS surfaces compared to control plastic. Extracellular matrix related proteins (Col I and Col IV) and enzymes (MMP1 and MMP3) were measured by qPCR, and collagens were downregulated on soft surface and MMP1 was slightly upregulated. We are currently comparing these qPCR data to results from patient tissue to determine the relevance of soft PDMS substrates as a biomimetic culture system. Future work will fabricate pores in PDMS so that Caco-2 cells can adequately polarize and more closely reflect epithelial monolayers and ideally crypts of the intestines.